"This latter was a remarkably large and beautiful animal, entirely black, and sagacious to an astonishing degree. In speaking of his intelligence, my wife, who at heart was not a little tinctured with superstition, made frequent allusion to the ancient popular notion, which regarded all black cats as witches in disguise." A black cat crossing one's path by moonlight means death in an epidemic. If a black cat crosses your path while your driving, turn your hat around backwards and mark an X on your windshield to prevent bad luck. If a black cat walks towards you, it brings good fortune, but if it walks away, it takes the good luck with it. A kitten is born in May will be a witch's cat. A black cat seen from behind foretells a bad omen. If you find a white hair on a black cat, you will have good luck. A strange black cat on your porch brings prosperity. But how did black cats become associated with Halloween to begin with? It probably started first with the belief that cats had magical powers. The Egyptians were in awe of them - sacred cats kept in a sanctuary in ancient Egypt were carefully tended by priests who watched them day and night. The priests interpreted the cat's movements - twitch of a whisker, yawn, or stretch - into a prediction of an event that would happen in the future. However later in history, the Druids feared cats - believing that by using evil powers, humans could turn themselves into cats. 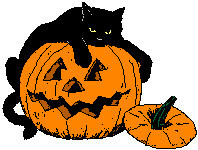 So during Samhain on November 1, many cats were thrown into the fires to get of rid the evil. Therefore, linked with the Druid's Samhain and as a witch's familiar, it is no wonder the black cat, with its piercing yellow eyes and arched back became the symbol of the spirit of Halloween.